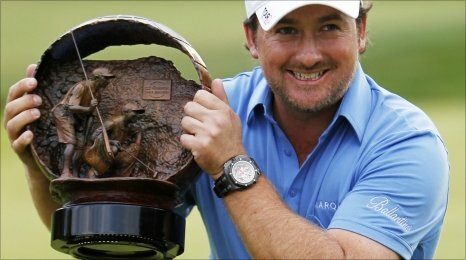 In an eventful day Graeme McDowell overhauled a four-shot deficit on Tiger Woods before beating the American on the first play-off hole to win the Chevron World Challenge.Earlier Woods with a lead was in a commanding position but he had lost his rhythm, and McDowell banked on it and nullified his lead and led by two after the 13th. But there still was a tie at the 16 under par at the end of 72 holes hence forcing a sudden death. McDowell then magnificently holed a birdie from 20ft as Wood's putt had failed to show its magic hence the US Champion came on to win the fourth title of the season.So, it was not at all the type of year Woods would have ever like to have, and it is his first win less year of his career.Woods took five months off since his much publicised revelation were unearthed.He had two fourth placed finishes at first two majors, and kept on struggling.Because of such an under performance Tiger Woods eventually lost his world number one position to Lee Westwood.However, on Sunday in California, Woods had a history of being confident , as previously he had never lost a tournament whenever he had lead of atleast three strokes. But he could only manage a 73 to McDowell's 69, while England's Paul Casey got third place on 12 under with Rory McIlroy another shot adrift.He began on 17 under but opened bogey,birdie,bogey, while playing McDowell,31, birdied the par-five second to edge to under 14 and got an other fourth to narrow the gap to one. McDowell and Woods birdied fifth before a succession of pars, but everything took a different turn then McDowell birdied 13 and Woods got a double bogey. Woods also had a terrible tee shot which got left rough and forced him to lay up.He let his hands off the club following another wayward shot as a wedge sailed over green, then again he chipped from the green, chipped from six feet past but failed to post on the seventh. But McDowell two shot lead was overcome at the 14th where he dropped his shot.Still one ahead, McDowell, found deep grass to the right of the par-three 17th green but took a drop and chipped a brave bogey.Woods later on made safe par three to go up the 18th tied with McDowell on 15 under.Playing for the18th , the US champion caught the tress on the right but got a enough on the first cut and hit similar approach as of earlier.Woods then ultimately had a putt of almost 15 feet.McDowell was first to go and produced a identical putt to the one he made on the 72nd hole as Woods failed to post the ball hence giving McDowell the title. It was McDowell's fourth win of the year, and brought 2010 on a healthy note. "2010 has been the stuff of dreams," the Northern Irishman said. "Playing one of the greatest golfers who has ever played and to beat him like this I'm just ecstatic," McDowell commented. Despite his victory, he predicted Woods would be of major attraction in 2011. "He used to appear invincible. Of course he has made himself appear more human in the last 12 months, but there's something a bit special about his golf game and I fully expect that mystique to return." Woods after defeat said: "The middle part of the round today was an exception, but I thought I did some good things this week. I'm proud of the way I played, even though I lost." So lets hope Woods get back his touch in 2011, and produce some awesome golf, and let his fans cheer about something.